Embellishments abound at this new Wallingford taqueria from the Heavy Restaurant Group, which also owns Barrio, Purple Café & Wine Bar and Thackeray. “But why stop there?” The question crops up a lot on the menu at Pablo y Pablo. Embellishments abound. You can smother your lunch burrito with salsas and cheese; top a salad with chicken or grilled prawns; add meat or mushrooms to your nachos. 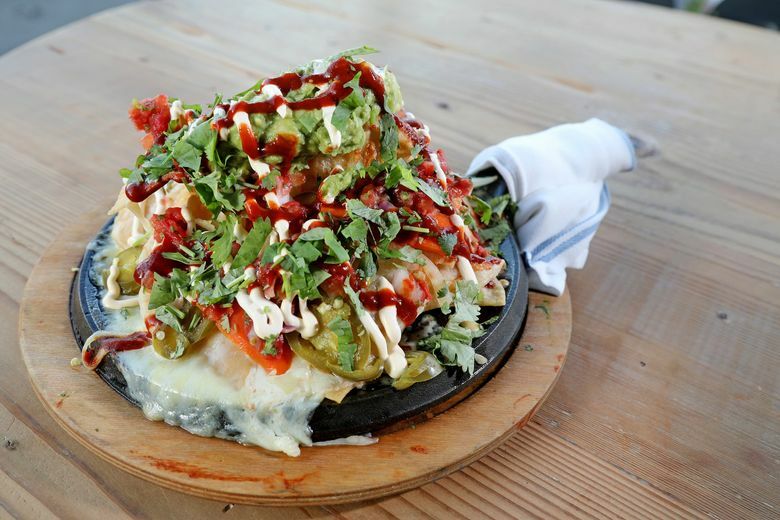 Nachos are popular at this new Wallingford taqueria. Here’s why: Each element has integrity — starting with the chips. Thick-cut La Mexicana white corn tortillas, freshly fried, provide the proper scaffolding for a lacy melt of queso, scribbles of crema, piquant pickled vegetables and a vivid convergence of spicy-sweet cascabel salsa, pico de gallo and guacamole, coarsely mashed with onion, chilies and cilantro. You could pile pork carnitas on those nachos. (Unless you avoid meat, in which case there is a version made with cashew cheese and vegan chorizo.) The soft, rich pork, simmered in its own fat, is really pork confit. 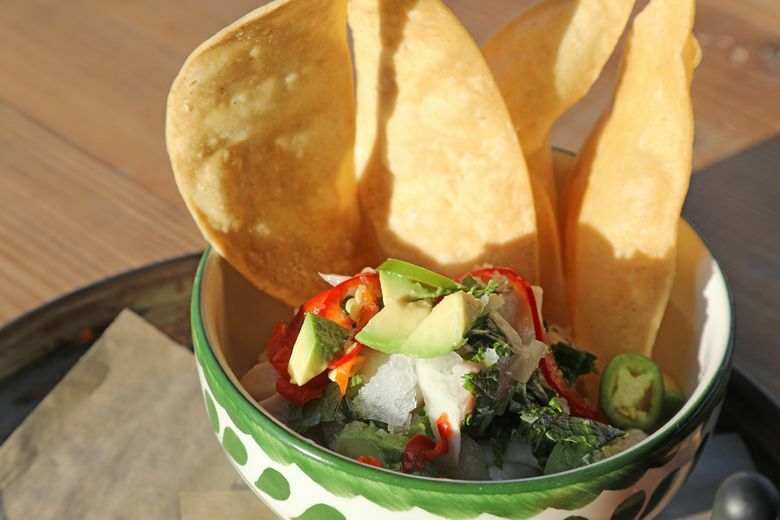 It’s so good it deserved to be eaten on its own, with lime wedges, salsa verde, guacamole and warm tortillas at the ready. Barrio chef Jeremy Flores assisted with Pablo’s initial menu development, but day to day, this kitchen is in the hands of new-to-Seattle chef Oscar Monroy, who was born in Guatemala and grew up in East L.A. In addition to nachos and pork carnitas, I admired the rockfish ceviche for its restrained use of acid and its accompaniments: ruby grapefruit, pickled fennel, fresh mint and cilantro. Fried cauliflower has agreeable companions, too. Pickled raisins, Fresno chilies and pepitas join crisp-tender florets lightly dredged in flour, not battered. Lime crema gives everything a lift. Pickled raisins also appear in a Brussels sprout salad that contained more kale than Brussels sprouts. I prefer the chopped salad. They sneak kale into that, too, but not enough to bully the romaine, the assertive oregano vinaigrette or any of the other ingredients, which include Spanish chorizo, chickpeas, cotija cheese and avocado. But why stop there? You won’t regret adding spicy grilled prawns. Enchiladas go easy on the cheese, letting the chipotle-braised chicken filling and vivid salsas shine. Ask for a mix of red and green salsas — or “Christmas” as they say in New Mexico. But don’t stop there. Get a side of beans or escabeche slaw. The beans are a mix of pinto and black in a cumin and chile-stoked tomato sauce. The crunchy pickled slaw contains cabbage, carrots and other slivered vegetables. Tacos were the iffy part of the meal. More than a dozen combinations range from the familiar to the fanciful. I applaud their originality — and the suppleness of the house-made corn tortillas — but some of the “baller” varieties (pork belly banh mi, wild boar meatballs, duck carnitas) were poorly executed and got to the table either tepid or cold. Best of the bunch was a Baja fish taco, a pleasing balance of battered rock fish, shredded cabbage, pico de gallo and chipotle aioli. Pork belly banh mi struck the right notes with pickled daikon, carrot, cucumber, cilantro and jalapeño, but the meat’s presence barely registered. Overly salty salsa roja did no favors for spicy wild boar meatballs already heavily burdened by Oaxaca and jack cheeses. I was intrigued by the pairing of fig mole with duck carnitas, but couldn’t detect a trace of the sauce amid shredded meat as dry as twigs. Brunch offered some well-constructed scrambled-egg tacos: one with mushrooms, poblano peppers and goat cheese; another with chorizo and fried potatoes. But popcorn-size nuggets of fried chicken on a syrup-soaked jalapeño pancake was a sorry spin on chicken and waffles re-imagined as a taco. A heavy biscuit with an overcooked poached egg under chalk-white gravy (rumored to contain jalapeño chicken sausage) severely disappointed. The flavorless gravy prompted us to dole out habanero hot sauce recklessly from a small bottle fitted with a medicine dropper. No doctoring was needed for chilaquiles, a sumptuously saucy mash-up of stewed chicken, cascabel salsa and the same sturdy tortilla chips used for the nachos. Drinks offered solace. Blood orange sweetened a Mimosa. 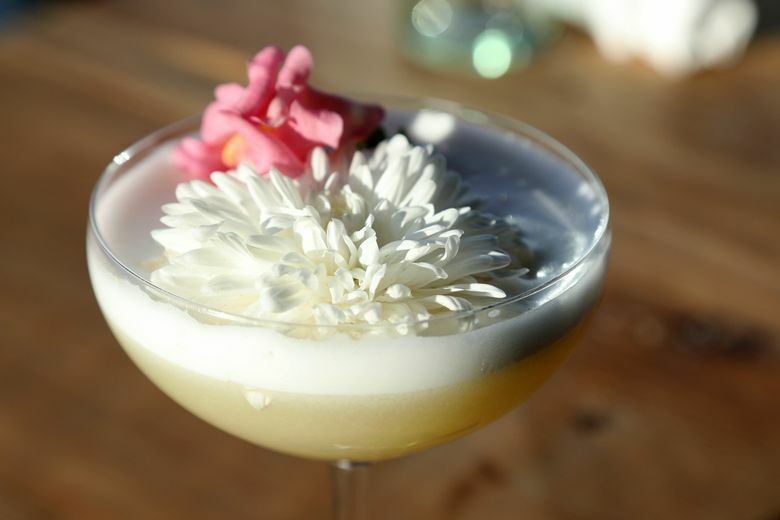 Margaritas come in flavors, too, but nothing says “let’s party” quite like “Jets to Brazil,” a sweet-and-sour cachaça cocktail, frothy with egg white, floating a red chrysanthemum. Any of those beverages are an ideal companion for fried hominy, a nibble that pits salt and lime against sweet corn crunch. Think Sugar Pops for grown-ups. Waiters were equally well-seasoned. The night the point-of-sale system went down and lengthy delays ensued, we weren’t the only table getting gratis ancho-smoked salted caramels with our check to make amends. The candies are chilled so that the brittle chocolate crackles when you bite, releasing a rush of caramel, salt and smoke. They are among the dessert choices on the menu (three for $7). But why stop there when you can buy a dozen for $26? Providence Cicero is the Seattle Times restaurant critic. Reach her at provi.cicero@gmail.com Follow her @provicicero on Twitter and Instagram.